Even in the best of economies, businesses — like yours in Baytown — need to guard against productivity crushers and budget waste. If you’re using a business telephone system that’s 10 years old or more, it’s safe to say that investing in a new, fully integrated voice and data solution will save considerable overhead costs and greatly increase productivity. Effective internal and external communication abilities directly impact business success. Your office phone system represents the virtual nerve center of your company. It keeps employees connected to one another and to clients, associates, and vendors. Technology has changed drastically over the years and the most cost efficient business communications systems integrate things like email, mobile messaging, mobile devices, business applications, and desktop computers. With an updated business communication solution, employees receive important messages and reminders in real time. No more phone tag; no more missed deadlines; no more angry clients or frustrated vendors. Staff members can participate in voice and video conferences from virtually any location — from across the globe, from home, from the field, or onsite. But, selecting a new business telephony system isn’t easy. You’ll need one that fits your company’s specific needs and allows for future growth. This requires extensive research and knowledge about how each possible system works and how it will impact your specific business model across various operational areas.  Whether your business has only a few staff members or a huge global presence with multiple locations, the Action Communication team has the knowledge and experience you need. Our highly knowledgeable, certified engineers and technicians will take time to fully understand your communications needs and goals. They will carefully assess the network cabling infrastructure in your building to determine its ability to handle new business telephony technology. No matter how high-tech a voice and data solution is, it’s only as good as the underlying network cable infrastructure. Action Communication has decades of experience in all aspects of structured cabling across all platforms. On premises, cloud based, VoIP, SIP, and more – we’ve done it all and we do it best.